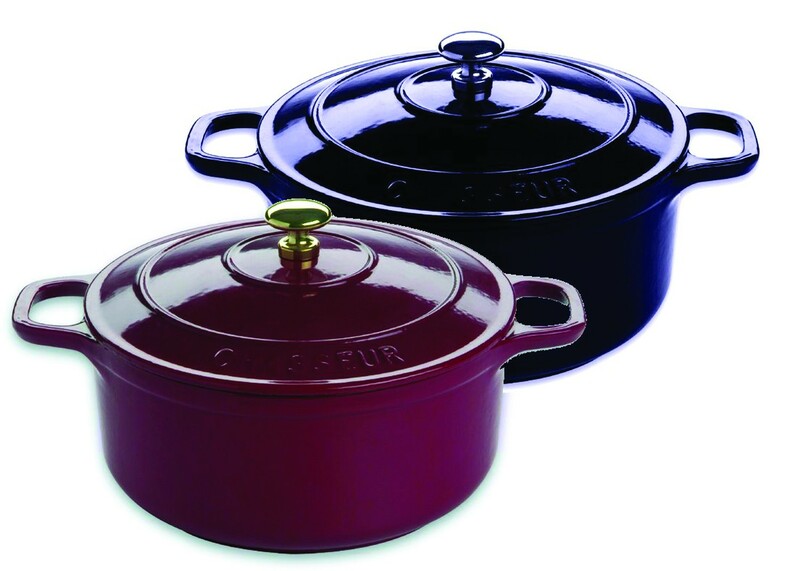 The Chasseur La Cuisson Ramekins are made with high-grade materials and a durable enamelled surface. The La Cuisson range from Chasseur offers the ultimate in versatility, you can bake, serve, store and create in it, each piece is hand-crafted individually, making each piece uniquely yours. Each set includes 2 x individual ramekins. Cookware & Kitchenware for Winter! Lamb shanks, beef stew, chicken casserole…what are you favourite dishes for this cold season? At Homes N Things we provide you with different cookwares to choose from, so you can stir up a storm in the kitchen! Made in Germany, the Fissler Vitavit Comfort 8L Pressure Cooker is designed to make pressure cooking safe, reliable and easy to use. There are several features which makes the Fissler Vitavit Comfort one of the premium pressure cookers available on the market. First of all, you know you have closed the lid correctly when a click is audible and a colour display in the handle switches from red to green (see thumbnail). Only then the pressure can build. Red means the temperature is too high and needs to be reduced. and Green means the set temperature has been reached and the cooking time begins. The Fissler Vitavit Comfort Pressure Cooker also has 2 cooking levels, a gentle setting for delicate foods such as fine vegetables or fish, and a speed setting for meats and stews. Other features also includes a removable handle to make cleaning easy, and a Cook-Star All Stove base which makes the Vitavit Comfort heat quickly and evenly, as well as making it suitable for use on every stove type. The Fagor 6L Duo Pressure Cooker makes cooking fast, easy and healthy. Made of 18/10 stainless steel, the aluminium sandwich base allows for even heat distribution and can be used on all stovetops including gas, electric, ceramic and induction. The Fagor Duo Pressure Cookers also features a safety lock on the handle to prevent the lid from opening before all of the pressure is released. Two independent over-pressure release valves ensures that there is no pressure build up inside the cooker. Comes with a 10 year manufacturer’s warranty. The Le Chasseur 26cm Round French Oven in French Blue is part of the premium quality French Cast Iron cookware on offer from their range. Double-enamelled for durability, each piece is created in separate casts to ensure that each finish product has excellent diffusion of heat properties without hot spots. Suitable for use on all stovetops, all Le Chasseur Cast Iron cookware comes with a 10 year guarantee. Roast chicken, potatoes and other delicious vegetables this winter with the KitchenCraft Molten Cast Iron Roasting Pan. Since 1850, Emile Henry, a family-run international company, has been manufacturing one of the world’s leading range of bakeware and ceramicware. Based in France, Emile Henry innovatively combines the traditional techniques of clay making with technological improvements to produce dishes which are more resistant to mechanical and thermal shocks. The Flametop Oval Stewpot from Emile Henry is an innovation in ceramic technology. These Clay Flameproof ceramic products work directly on a gas flame or an electric halogen hob without a diffuser, without any fear of cracking or breaking. 30% lighter than comparable metal cookware products, the Flametop ceramicware range from Emile Henry is also microwave-safe and dishwasher-safe, cleans up very easily, is extremely strong and durable, goes under the broiler and can go directly from a freezer or a refrigerator to a hot oven to the table, where it will retain the cooking heat for a very long time. The Le Chasseur 25cm Square Grill Pan is part of the premium quality French Cast Iron cookware on offer from their range. Double-enamelled for durability, each piece is created in separate casts to ensure that each finish product has excellent diffusion of heat properties without hot spots. Suitable for use on all stovetops, all Le Chasseur Cast Iron cookware comes with a 10 year guarantee. Christmas is not too far away, have you chosen your Christmas presents for your love ones yet? If not here are some great ideas from Homes N Things, offers you everything from Scanpan cookware to Sheridan bed linen! Beach lovers – Colourful and vibrant, Kas Australia’s stunning collection of beach towels is just what you need for a fun day out at the beach. The Kas Birdie Red Beach Towel is generously sized at 100 x 180cm to keep you comfortable while lying down, and is made from 100% cotton. Colour by Scanpan – Add a splash of colour to your kitchen with the Scanpan Classic Coloured 28cm Lime Green Frypan. Made from squeezed cast aluminium with a patented ceramic titanium surface, the GreenTek non-stick surface of Scanpan’s Classic Coloured cookware is extremely effective for frying without the use of oils, and are safe to use with any utensil (including metal utensils). Guaranteed not to warp, all of Scanpan’s Classic Coloured cookware are oven safe and provide fast & even heat distribution with superb heat retention. The stay-cool bakelite handles are attached via a patented locking system without the use of screws or rivets for maximum durability. Easy to clean and dishwasher safe, Scanpan’s Classic Coloured Cookware are suitable for all stovetops except induction. Indulge in ultimate luxury – The Sheridan Luxury Egyptian Cotton Towel Gift Set in Graphite spoils the senses, with the softness and high absorbency of its combed ring-spun Egyptian cotton yarns. This gift set includes 2 queen towels and 1 hand towel, and is available in Snow and Graphite. Gadget for everyone – Simple Human’s Silver Sensor Soap Pump dispenses soap touch-free to help avoid cross-contamination. Simply place your hand under the sensor to dispense soap automatically. An optional LED light timer blinks for 20 seconds to indicate how long to lather for germ-free hands. Four volume settings allow the pump to dispense preset amounts of soap or lotion. Operates on 4 x AA batteries (not included). Coffeholics – Store your coffee pods neatly and right where you want them, with the Capital 50 Carousel in Fire Engine Red. Each carousel stores 40 coffee capsules and a box of 10 (not included). Love quality cookware – The Le Chasseur 25cm Square Grill Pan in Inferno Red is part of the premium quality French Cast Iron cookware on offer from their range. Double-enamelled for durability, each piece is created in separate casts to ensure that each finish product has excellent diffusion of heat properties without hot spots. Suitable for use on all stovetops, all Le Chasseur Cast Iron cookware comes with a 10 year guarantee. Fragrance for interiors – The Abode Aroma Kimono Yuzu Flower Aromatic Diffuserbrings the tart, scarlet bud of the Yuzu flower, combined with an exotic lilac and cedar accord. The Kimono range from Abode Aroma brings sophisticated ambience, elegance and luxury to your surrounds. Each fragrance from the Kimono range are presented in a stunning geisha-themed package. For the Masterchefs – The Marcato Atlas 150 Wellness Pasta Machine is the most versatile manual pasta machine available on the market today and also the most widely sold. A complete system of attachments can be applied to the Atlas Pasta Machine, to allow 15 different types of pasta to be created: from spaghetti to ravioli, from lasagna to angel hair and much more! The rollers are made of special nickel-plated steel with a double slotted opening, and all of the gears are in case-hardened and tempered steel to create a highly durable pasta machine. For the DIYs – With the Cuisinart Pink Ice Cream Maker, you can indulge in home-made frozen desserts and those delicious “island” drinks made from your favourite fresh ingredients right at home! Finish a family dinner or celebrate a special occasion. Any excuse will do. The Cuisinart Frozen Yoghurt – Ice Cream & Sorbet Maker lets you make enough of your favourite recipes to please a crowd. It’s fast and easy. Plug and Play with e-Bodum – When you don’t want the hassle of cleaning up a big mess afterwards, the Bodum Bistro Purple Electric Hand Mixer is just what you need to get the job done. From whipped cream to mashed potatoes, the bistro electric hand mixer comes equipped with a powerful 5-speed motor to handle a wide variety of tasks including kneading bread dough or mixing cake batters. The electric cord also rolls up inside the mixer for easy and neat storage. So what’s your favourite gifts of all? Feel free to leave comments and suggestions below! The Le Chasseur 31cm Oval Casserole in Inferno Red is part of the premium quality French Cast Iron cookware on offer from their range. Double-enamelled for durability, each piece is created in separate casts to ensure that each finish product has excellent diffusion of heat properties without hot spots. Suitable for use on all stovetops, all Le Chasseur Cast Iron cookware comes with a 10 year guarantee. What comes to your mind when you hear the term “Cast Iron Cookware”? Double-enamelled for durability, each piece is created in separate casts to ensure that each finish product has excellent diffusion of heat properties without hot spots.